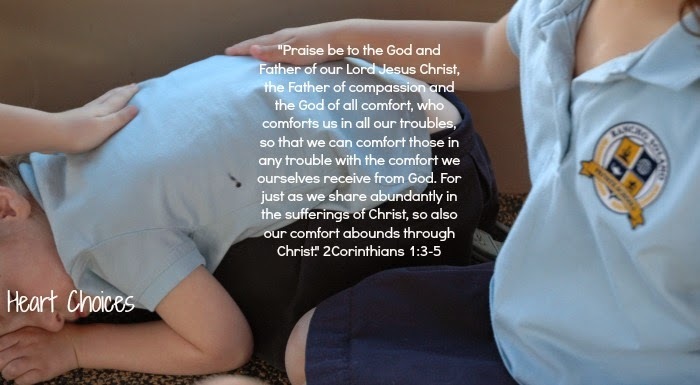 Comfort one another. But how do you comfort another person? Do you find yourself at a loss for words when tragedy strikes someone you know? What do you say to a friend who is grieving after the death of a loved one? As I watch the news, it seems there are more and more tragedies occurring lately. I don't know if it's that information is spread more rapidly online. Or is it that we are witnessing people in this world openly acting out what's in their hearts? To continue reading, please go to Laced with Grace. can't believe, I was working so hard on my comment, when all of a sudden this screen went blank. I can't seem to get back to it. I was remembering all the kind things you did for me when Jason died. You were there for me in so many ways.....taking me shopping for clothes to wear to the viewing, making a casserole and then staying to eat with us (that was so right, not leaving us alone to "probably not eat," but staying to make sure we did.) You put off a departure time for your vacation, and you were just there for me. You didn't judge me in my pain, didn't correct misspoken words, just were there. Cards and phone calls, lunches and visits.....all are good and needed. But sometimes that ministry of "our presence," is so meaningful to friends. Words are not all that important, in fact, sometimes we try to fill up spaces with words when actually, a quiet space is all that is really needed. Comfort.......the love of friends, prayer, presence, and a good casserole go a long way. Love you Debbie.